How Does T. Rowe Price Group Actually Make Its Money? Breaking it down for shareholders. For the last 29 years and counting, T Rowe Price Group (NASDAQ:TROW) has increased its dividend. That puts the financial firm in the company of other Dividend Aristocrats -- companies that have increased their dividends for at least 25 consecutive years. T Rowe Price has obviously found a way to make money that works. For current and prospective shareholders hoping the dividend will continue its amazing streak, it's worth it to take a moment to understand exactly what that is. Fundamentally, the firm makes its money by managing client assets in mutual funds. T Rowe operates a host of different funds with a variety of strategies, goals, and methods. But each, at its core, is about helping investors successfully build wealth through investing. The company also brings in revenue through administrative and servicing fees, but it's clear that mutual funds are the cornerstone of the business model. T Rowe has equity funds, fixed income, money market, and alternative options. For the company's customers, it's a one-stop shop for advice and investment choices of all shapes and sizes. With this business model, the company earns a percentage fee based on the amount of assets under management in any given mutual fund. Revenue changes based on the amount of money being managed in the funds. The more assets under management, the more is collected in fees, and therefore more profit. For T Rowe's U.S. mutual funds, average assets under management were $506 billion in the second quarter, an 11% year over year increase. Assets under management in the company's other investment portfolios increased 6% over the same period to $277.4 billion. T Rowe Price Group must be doing something right -- its dividend is a testament to that. But historical success does not guarantee future performance. The business model creates a strong, recurring stream of fee income, and all those assets under management are unlikely to disappear overnight. The result is a stable core book of businesses that steadies the company well over time, hence the 29 straight years of dividend increases. But the model isn't perfect. In times of economic turmoil, investors have a tendency to pull their cash out of the market. When that happens in sufficient numbers, even T Rowe Price is subject to big swings in revenues and profits. The fourth quarter of 2008 is an example, when problems throughout the markets -- from equities to money market funds -- drove T Rowe Price's financials sharply lower. The pattern is consistent, though not as severe, in prior periods of stock market chaos. And yet, despite those rough periods, the company has stuck to its policy of ever-increasing dividends. As long as Americans continue to invest in mutual funds, odds are good that T Rowe will continue to deliver strong revenues, profits, and dividends. The company isn't immune to volatility and downturns -- no company is -- but T Rowe Price's long and successful history is strong evidence that the company has what it takes to take the hits when they come and continue putting dividend checks into investors' pockets. 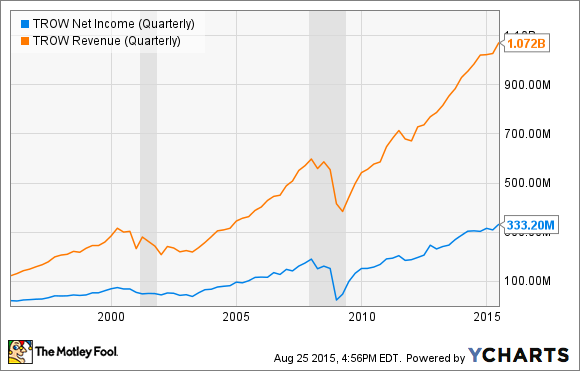 How Safe Is T. Rowe Price (TROW) Dividend?